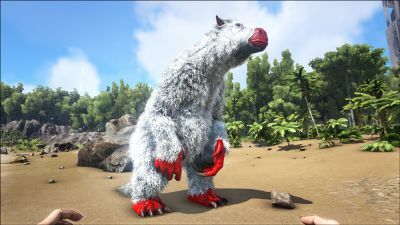 The Megatherium (meg-ah-theer-ee-um), or Giant Sloth, is one of the creatures in ARK: Survival Evolved. Megatherium formipavor is one of the larger mammals on the Island. This is most shocking because it is essentially a giant sloth...if you crossbred it with an elephant and a bear! Because of its size and girth, the Megatherium is uncommonly resistant to being knocked unconscious. Despite primarily being an herbivore, a typical Megatherium is very intent on consuming the Island's many insects. It is particularly adept at removing their insides without damaging much of the shell, maximizing extraction of chitin. The otherwise slow and peaceful Megatherium becomes faster and aggressive in the presence of these creatures. Megatherium is an incredibly useful creature to tame, so long as you don't intend to fight other tribes. It's enormity, high resistance to torpor, and voracious attitude toward insects (and arachnids) makes it ideal for farming large quantities of chitin from the bugs of the Island, or simply defending against them. Megatherium is a slow, gentle creature that will not attack a player unprovoked. This changes if there are insects nearby, at which point the Megatherium will become aggressive to any insect, player, or dinos nearby. This is accompanied by a cloud surrounding its head to indicate it's transitioned state of temper. Among the largest mammals yet found on the island, the Megatherium is a slow-moving and formidable omnivore, roughly similar to a bear in appearance, but with a small head and heavy limbs that betray its sloth ancestry. While normally content to browse from tall trees or dig for roots and tubers, giant sloths are avid insectivores and will prey upon the island's giant arthropods when they can, cracking open exoskeletons with their hooked claws and extracting the meat with a long, muscular tongue. Smaller insects like the Titanomyrma are eaten wholesale. This section displays the Megatherium's natural colors and regions. For demonstration, the regions below are colored red over an albino Megatherium. The colored squares shown underneath each region's description are the colors that the Megatherium will randomly spawn with to provide an overall range of its natural color scheme. Hover your cursor over a color to display its name and ID. For example, "cheat SetTargetDinoColor 0 6" would color the Megatherium's "main body" magenta. Build a small bin with stone pillars and metal fence foundations to knock this huge beast down, stay aware that when you try to knock him out in an open area on a mountain, he is able to simply knock you off the mountain. This section describes how to fight against the Megatherium. The Megatherium is a large omnivore, eating both plants and animals. It is slightly larger than the Wooly Rhino, but smaller than the Mammoth. They are similar to a Chalicotherium, walking on their knuckles and they can even sit. The Megatherium can easily get stuck on rocks and trees. By then taming or killing is very simple. Any gun or a crossbow can make short work of a Megatherium, but it is advised to have a mount nearby, as Megatherium can be quite fast. Becomes more powerful when it kills insects. It will get a glowing aura around it which means, like it says below, the "Bug Killer" buff is active. Because of this, they should be avoided at all costs when riding an insect mount. Especially if they are high level, even a melee damage oriented mantis with a good quality sword is in extreme danger in the vicinity of these creatures. If chased while riding a Mantis, use their leap attack to get away! It is worth noting that when the 'Bug Killer' buff is active, Megatherium appears to enter an 'enraged' state. During this period, any creature (or player) close enough to them are at risk of being attacked. The Megatherium loses a lot of power when not buffed. If it is buffed then attack it with ranged weapons or wyverns. Don't come too close if it's buffed! For example, a level 12 buffed wild megatherium is capable of doing around 150 damage per hit. Once a ridden Megatherium kills an insect ( Meganeura, Giant Bee, Titanomyrma, or Pulmonoscorpius) or arthropod ( Araneo, Arthropleura, Mantis, or Trilobite), it will get a buff called "Bug Killer". Bug killer causes the Megatherium's damage to multiply by 250% to any target for 120 seconds (which is multiplicative with the passive 150% multiplier against bugs.). When "Bug Killer" is active while fighting bugs, the Megatherium's damage will be multiplied by 375%. In addition, this buff reduces all damage by about 75% (35 damage from a tranq arrow fired from a primitive crossbow is reduced to 8 damage on a wild Megatherium.) This makes the Megatherium incredibly potent against bugs. Harvesting the bug's corpses will yield a massive amount of Chitin. At 200% Melee Damage, you can easily get 200+ chitin from a single scorpion. They are, however, too large to fit into many caves unless you take them in Cryopod. A Megatherium under its "Bug Killer" buff can make killing Deathworms a much easier process. A Megatherium makes killing the Broodmother Lysrix much easier due to its "Bug Killer" buff and is also able to easily fend off the many Araneo spawned by the boss. The full-name of the Megatherium Formipavor means "Great beast that causes fear", a reference to its size and large frightening claws. Although described as omnivorous, the real animal was likely just a herbivore. This change in diet is based on the dietary habits of anteaters (which are related to sloths) and a controversial theory that Megatherium may have supplemented its diet with meat. 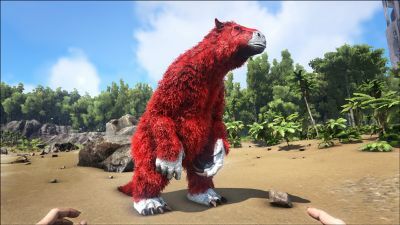 The Megatherium in-game is one of the most accurate models of any genera present. The only noticeable inaccuracy is that the ARK creature walks on its whole foot like most animals. It is known from trackways of other ground sloths, the design of the animal's feet, and modern relatives such as the giant anteater; that ground sloths actually walked on the sides of their feet. ↑ Introducing the Megatherium & ARK Digest #12! This page was last edited on 19 April 2019, at 11:43.